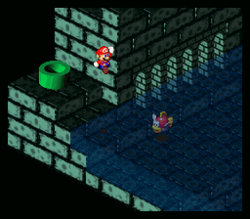 Mario in Kero Sewers in Super Mario RPG: Legend of the Seven Stars. 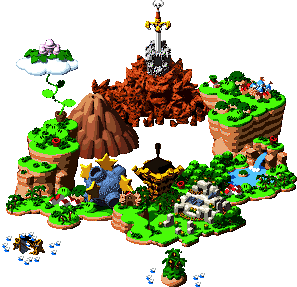 Kero Sewers is the sewer system of Mushroom Kingdom in Super Mario RPG: Legend of the Seven Stars. Kero Sewers is located above Midas Waterfall and is guarded by the dreaded dog monster Belome. Moreover, a tunnel in Land's End leads to the Kero Sewers, which Mario and his party enter to find - among other things - a jar of Cricket Jam, a Star, and many strange monsters on the way. Kero Sewers also appears in Mario and the Incredible Rescue. Mario, Luigi and Toad use this shortcut so they get to Bowser's Keep faster. However, they end up in Cybele's forest and end up meeting Cybele who tells them to collect six Mushrooms. The first black Mushroom is in Kero Sewers, which the gang then returns to. Piranha Plants roam Kero Sewers here, although Piranha Plants didn't appear here in the actual game. Kinokero Suiro Kino Kero Sewers, consisting of kinoko (mushroom) and kero (a frog's croak).